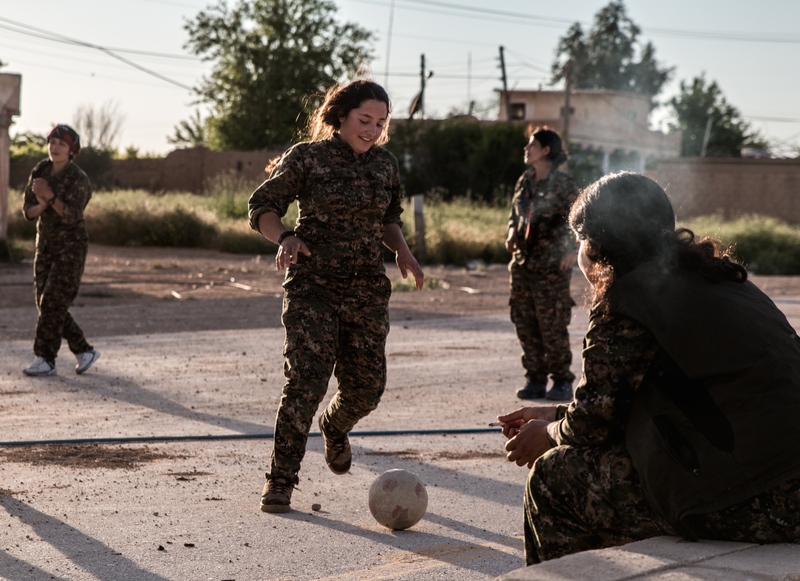 Among the Kurdish fighters holding the line against ISIS in Syrian Kurdistan, or ‘Rojava’, are several all-female detachments, part of the YPJ – the Women’s Protection Units. 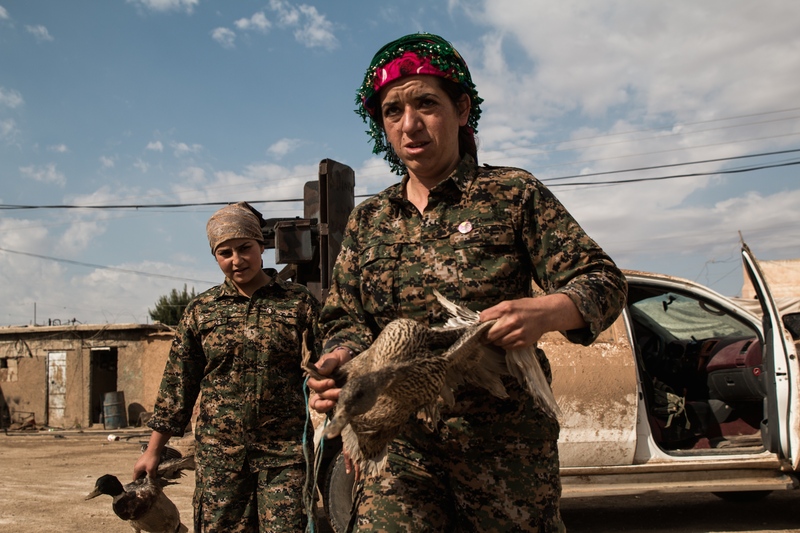 Formed in 2012, the YPJ, alongside their male counterparts in the YPG, are responsible for the external security of Rojava and constitute a significant number of Kurdish battlefield troops fighting in Syria. Ideologically different from the Iraqi Kurdish Pêshmerga, the YPG and YPJ are closely aligned with the socialist ideas of Abdullah Öcalan, leader of the PKK and champion of the concept of ‘democratic confederalism’. Women have long formed a part of armed struggle in Kurdistan, not just in Syria, but also fighting in Iraq, Turkey and Iran. 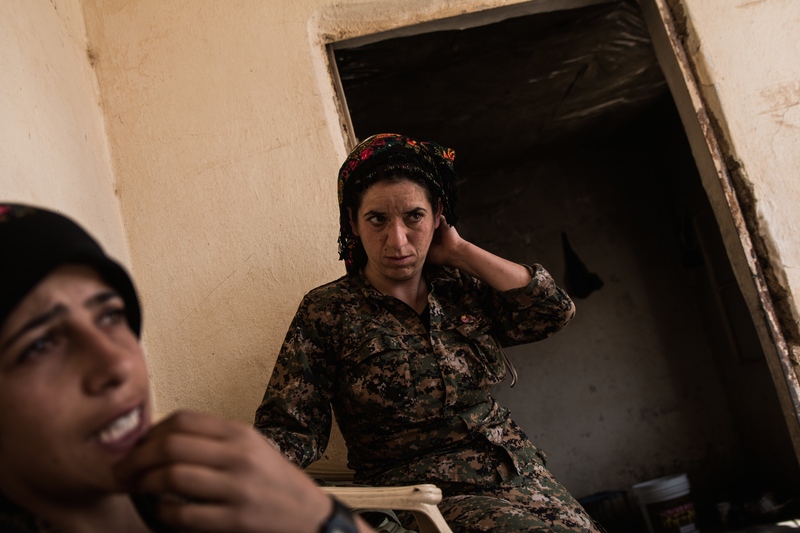 Where YPJ and YPG units fight together on the frontline, women commanders often lead groups of male soldiers into battle. 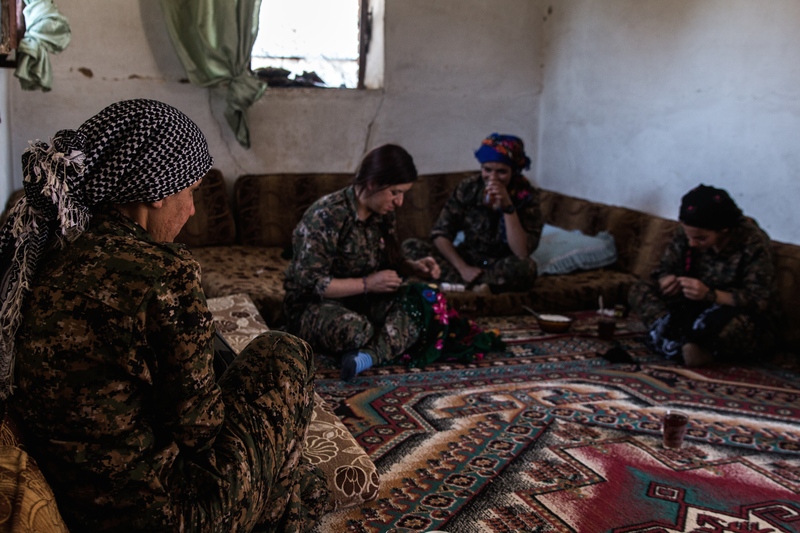 Today, in Syrian Kurdistan they continue their fight not only to defend their homes against ISIS, but also for equality in a traditionally patriarchal society. 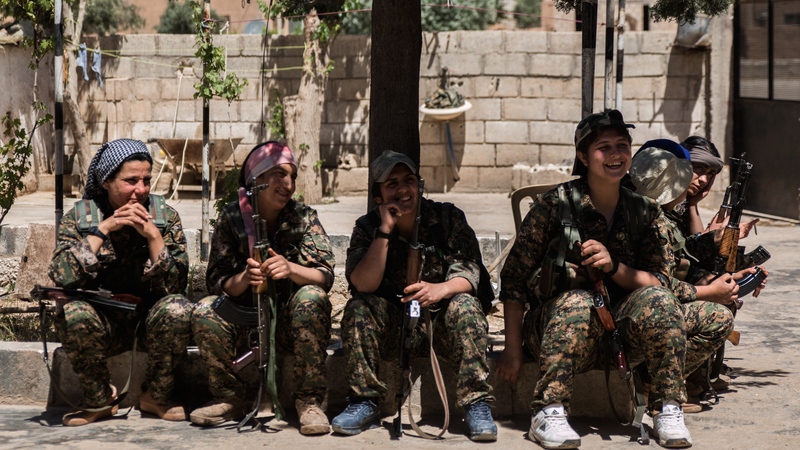 YPJ fighters share a joke in between training for an upcoming assault on an ISIS-held village. Photograph: Michael McEvoy. A YPJ fighter supports her YPG colleague whilst storming a building in training. Photograph: Michael McEvoy. 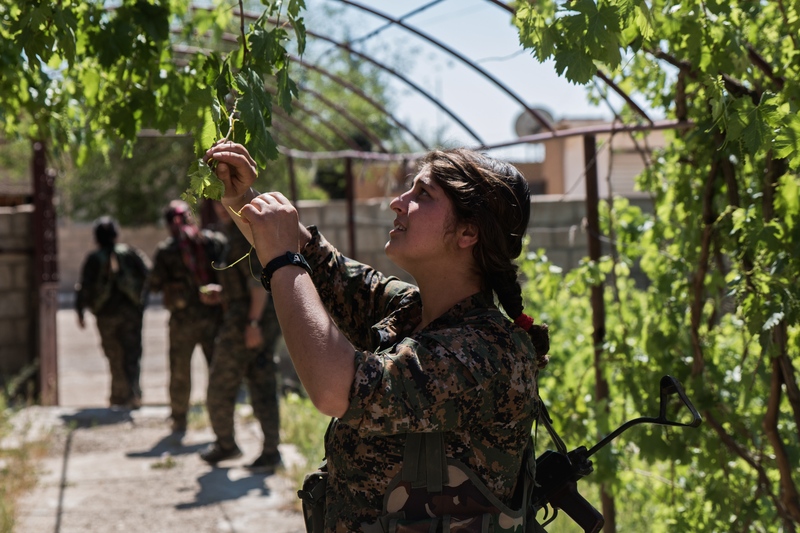 A female fighter looks for grapes among an abandoned Christian village. Photograph: Michael McEvoy. Women soldiers take advantage of a lull in the fighting on the frontline to relax. Photograph: Michael McEvoy. Kurdish units often occupy the villages they take back from ISIS fighters for their own accommodation. Previous inhabitants have often long since fled, taking only what they could carry. Photograph: Michael McEvoy. Logistics resupplies are often difficult in cut-off positions, so fighters have to improvise with what they find to supplement their diet. Photograph: Michael McEvoy. Edessa, from ‘Rojhelat’, or Iranian Kurdistan, poses for a picture taken by her comrade. 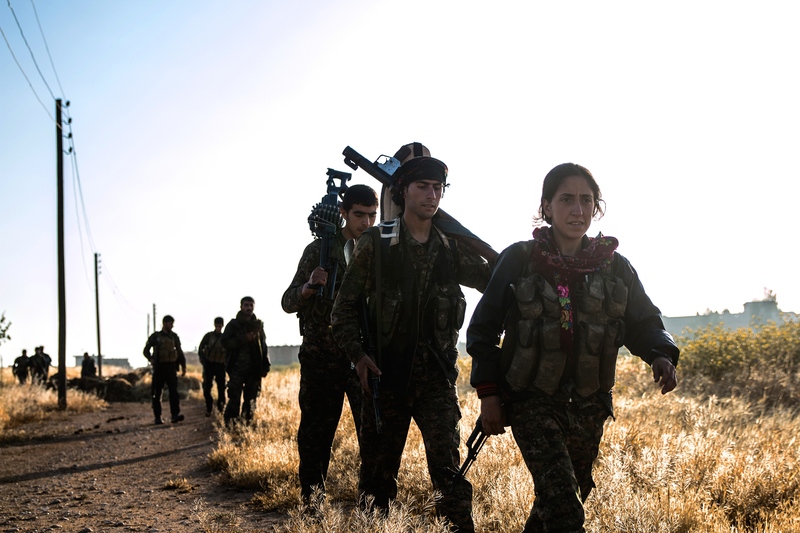 Those fighting in Rojava come from all over the Kurdistan region and speak a variety of languages and Kurdish dialects. Photograph: Michael McEvoy. 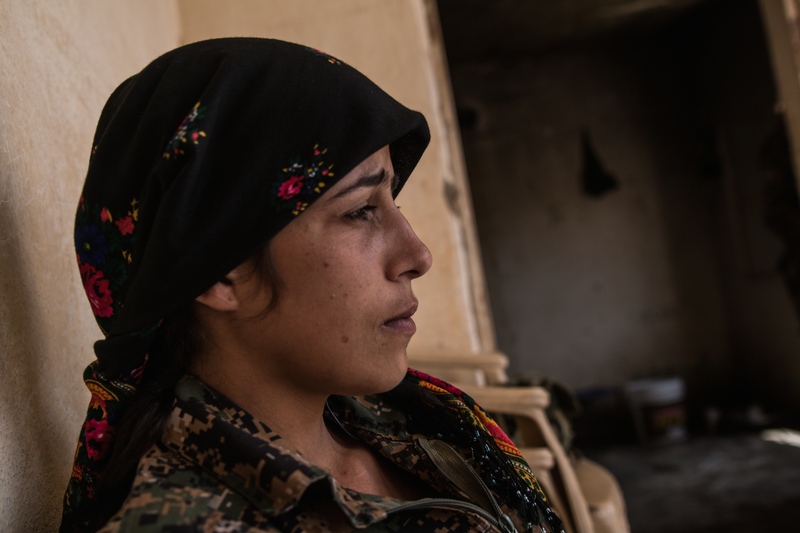 A YPJ fighter reflects whilst waiting for the upcoming assault on ISIS territory. Photograph: Michael McEvoy. 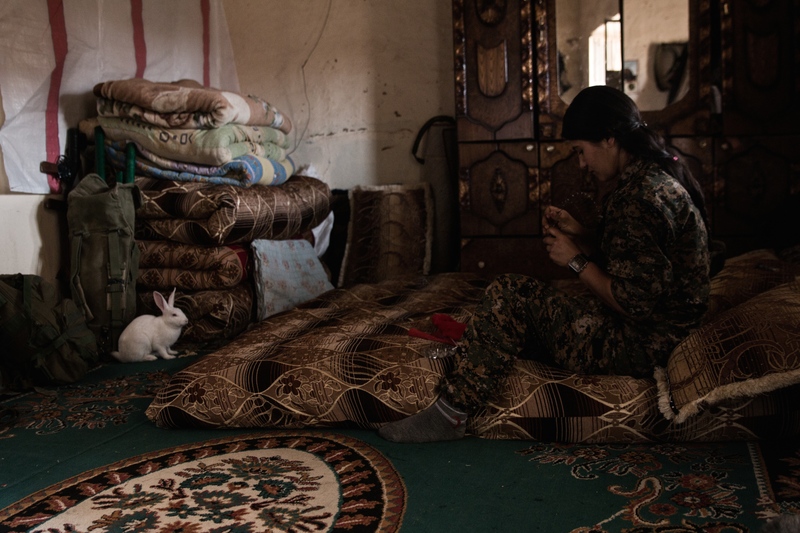 Hundreds of miles away from her family, a young female fighter finds comfort in the company of a pet rabbit as she cleans her weapon. Photograph: Michael McEvoy. Commander Takoshin has been with the movement since its formation in 2012, and also has previous experience with the PKK. 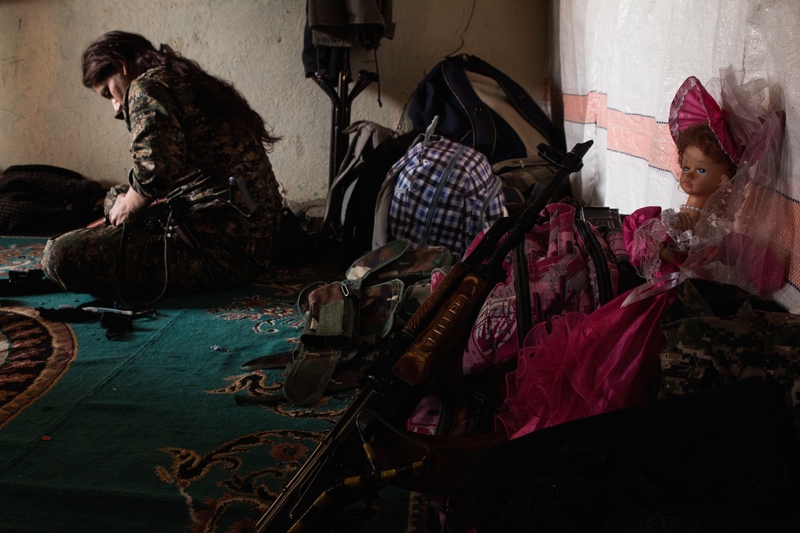 Today women make up nearly half of the PKK’s membership. Photograph: Michael McEvoy. 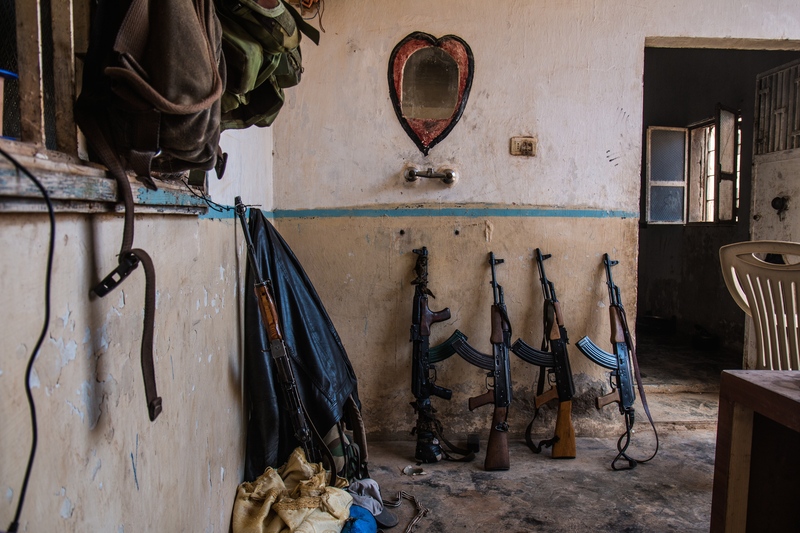 Weapons are left outside while fighters prepare lunch. 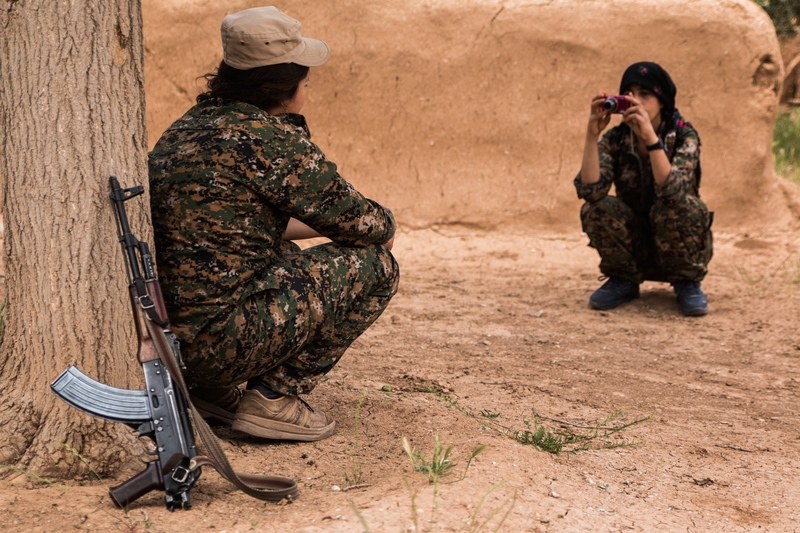 Neither the YPJ nor the YPG are particularly well equipped, the Kalashnikov assault rifle being the weapon of choice in most cases, although Russian light machine guns, mortars, and home-made sniper rifles are also made available to some units. Photograph: Michael McEvoy. Commander Takoshin cleans her Kalashnikov assault rifle in the girls’ sleeping accommodation. Photograph: Michael McEvoy. 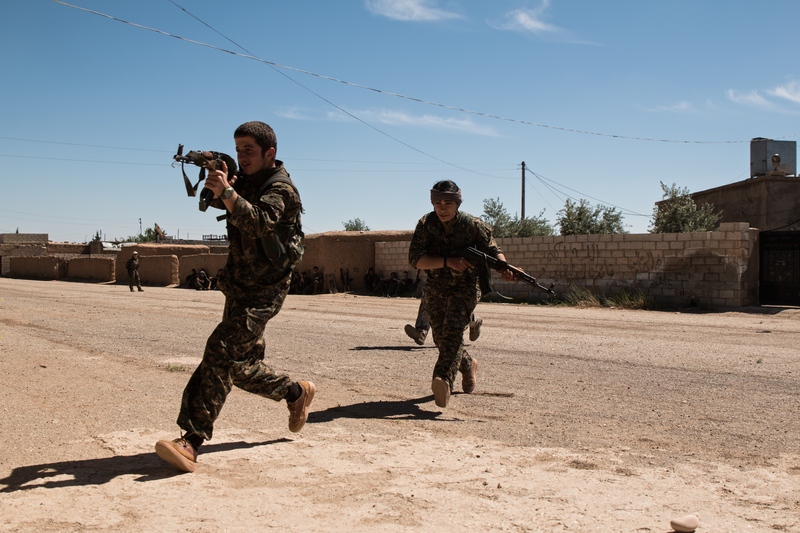 A YPJ commander leads her troops into battle at the start of the May offensive in Hasakah to try and retake the Abdul Aziz mountains which flank the Cizre canton of Rojava. 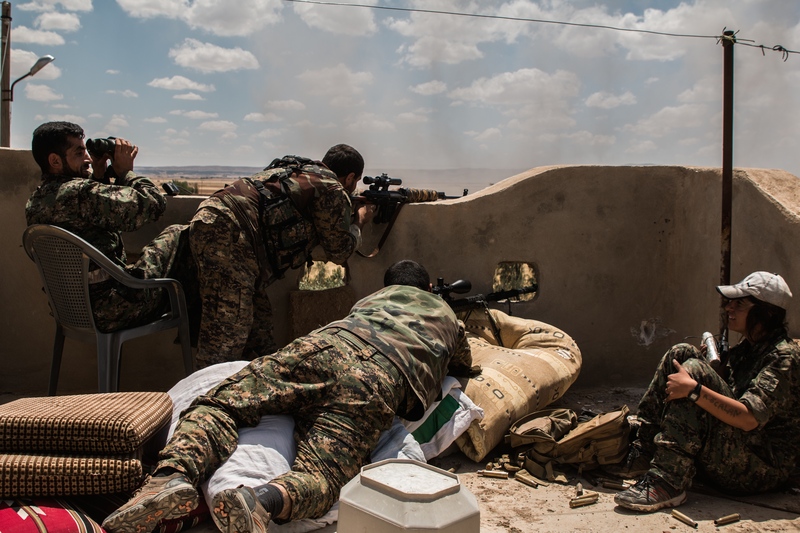 Greatly aided by coalition airstrikes, the offensive was initially successful, however ISIS have already begun counter-attacks in an effort to push back towards the city. Photograph: Michael McEvoy. Sniper teams provide harassing fire onto ISIS positions as ground troops advance during the offensive. Photograph: Michael McEvoy. 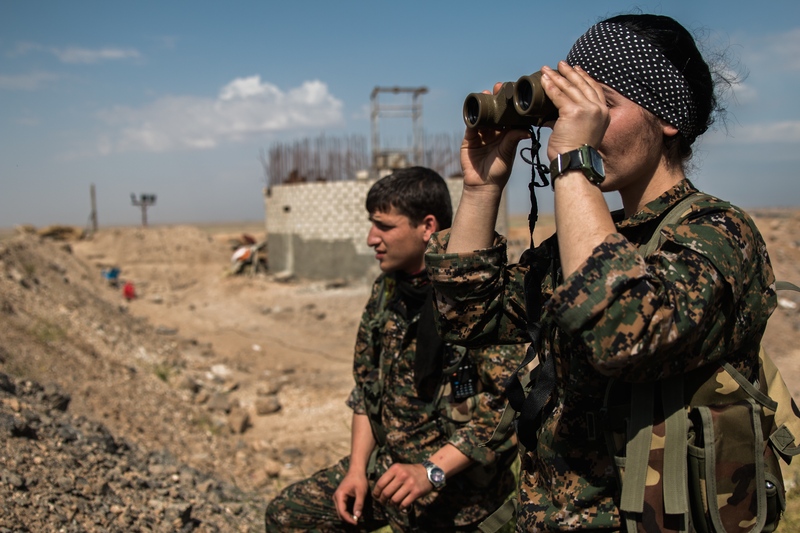 Commander Malsa surveys the terrain between Kurdish and ISIS lines as troops prepare to move forward. Photograph: Michael McEvoy. 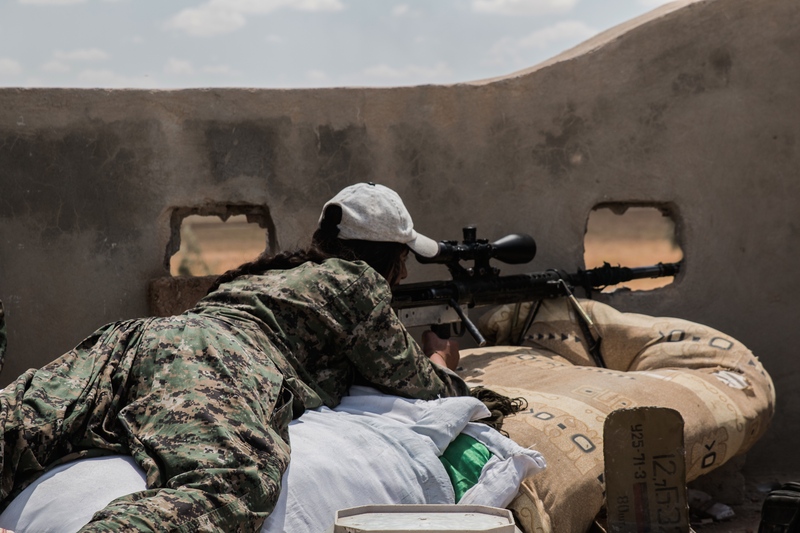 A female sniper and veteran of the PKK takes aim at ISIS fighters in a nearby village with a homemade ‘shiyar’ rifle. Photograph: Michael McEvoy. 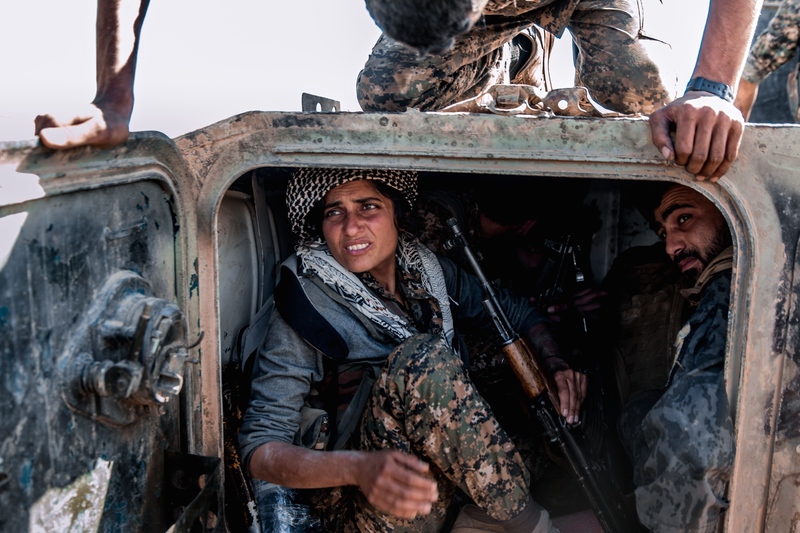 In the final push to try and break into the ISIS-held village, a female fighter mounts up with her male comrades into a Russian-made BMP armoured personnel carrier. Much of the armour used by the YPG and YPJ has been taken from ISIS and subsequently repaired in Qamishli town. Photograph: Michael McEvoy. 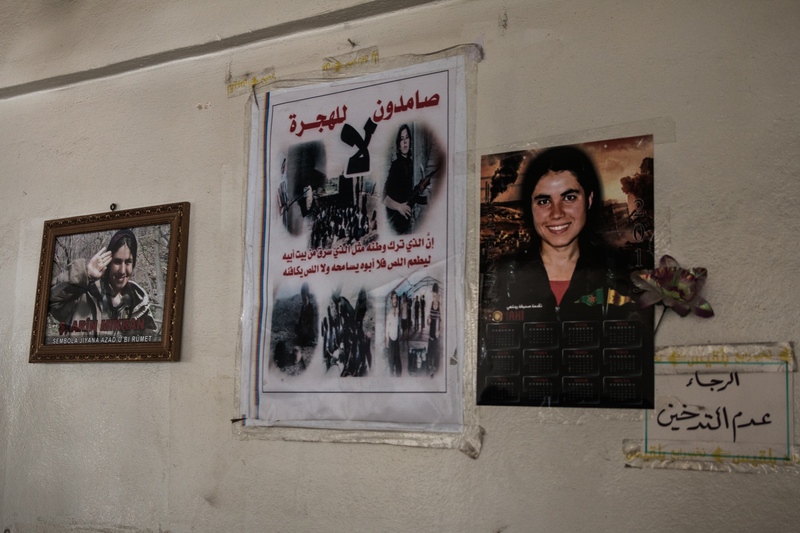 The poster of Arin Mirkan, a YPJ fighter who blew herself up to stop an ISIS advance at Kobane is now ubiquitous across Syrian Kurdistan. Photograph: Michael McEvoy. Posted in PICTURES and tagged #ypg #ypj #ISIS. Bookmark the permalink.